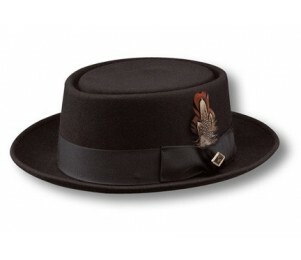 A hallmark of the American jazz era, pork pie hats are a constant classic in the world of fashion. These accessories were also popular in Great Britain, which helped these iconic and ever-popular hats to become a lasting addition to the classical fashion ensemble. This type of hat is especially popular among the musical crowd, having gained its popularity among jazz musicians of the 1930’s and 40’s, and cropped up once again in the 60’s and 70’s along with newer forms of music. Recently, the pork pie has had a large resurgence due to Bryan Cranston's portrayal of Walter White in the TV show Breaking Bad. White donned the pork pie hat as he appeared as his alter ego "Heisenberg". Though there are several variations in this style of hat, the basic shape normally stays the same – a thing, slightly curled brim with a crown that is slightly domed at the top. The crown is what tends to vary most in this style, sometimes being almost entirely flat or totally rounded. Pork pie hats are perfect for fun additions such as colorful hatbands, buttons, feathers or anything else that the wearer would like to add in order to further spice up this classic look. Furthermore, these hats come in almost any material or color that a customer could wish for, ensuring that anyone can find the perfect pork pie hat for any wardrobe.